On Monday we are going out of town to visit my husband's birth-mother in Germany for 2 weeks. This was a tough decision, but I'm going to leave all my paints here and bring only a brand new watercolor set, some pens and my sketchbook. My hope is this will force me out of my comfort zone. Ahh! I might post some things on my Facebook page, but probably nothing here until after April 4 (unless I end up painting tomorrow). I also won't be able to ship any paintings until after April 4. Can't wait to see the work, which I'm sure will be great. 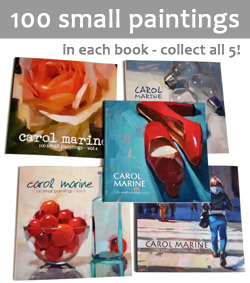 Carol you've made such a mark on my art with all your generous advice over the years. I wondered how you managed to keep going without burnout. I hope you can manage to keep a travel journal. I just love this tulip series! 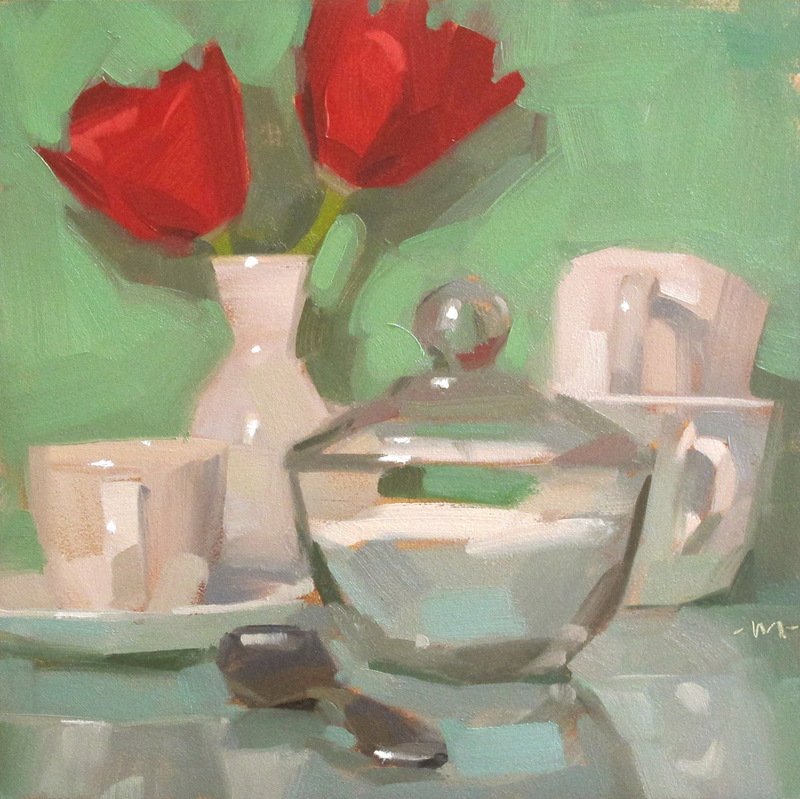 I like this composition, the whites - masterfully painted - and the red tulips! Enjoy watercolors..they start as a convenience, but then have a way of roping one in until it's love and that's all. Here's hoping you have a great time! You'll probably take hundreds of great shots to paint from. I am reading your blog from the beginning already one week. I just found your demo on youtube, it was so interresting that I went on your dailypaintings blog. I like your painting very much and comments are very usefull. You have made a real progress in your style. I looked also blogs another painters from you site and was inspired about this idea to paint every day and publish it in internet. But I have to learn more about it. Wonderful vibrant red! So cheerful and bold. Lovely painting. Love your paintings, my wife now does abstract and wonders about 3D effects. Please take a look at her paintings if you have time to spare and let us know what you think?